See who is coming and check start times! DVOA is pleased to offer a weekend full of orienteering. In addition to the US Relay Championships and the US Intercollegiate Championships, there will be a one-day classic orienteering A event and a Temp-O event. Silent Auction to benefit the University Team! In August, the OUSA University Team will travel to the Czech Republic to compete in the World University Orienteering Championships. To help them along financially there is going to be a Silent Auction on Saturday, April 26th at the meet site. The collection of items and bidding will start at 9.15AM, bidding will close immediately after the awards ceremony. We are looking for donations of saleable items such as baked goods, gently used vintage O meet t-shirts, vintage Team uniforms, meet entries to your club's next A meet or local event, an orienteering training lesson, the SI finger stick that you don't use anymore, knit or crocheted items, plants, wine...actually, anything that someone would be willing to pay money for! This is a great opportunity to donate some of those things that you no longer use but that someone else would like to own. All donations are welcome! 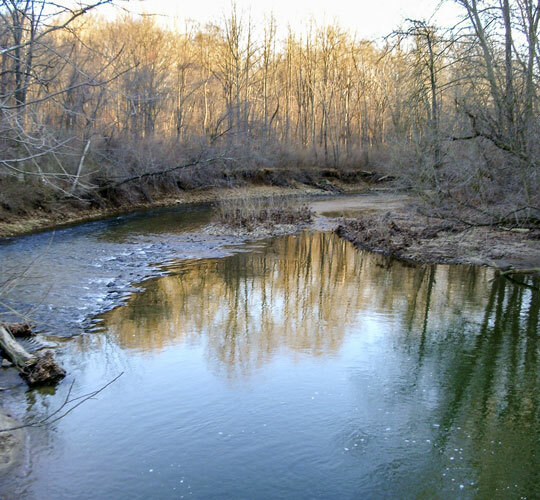 The events will take place near Newark, Delaware on revised and expanded maps of Fair Hill Natural Resources Management Area and White Clay Creek State Park. Registration closed Monday, April 14th, 2014. Late fee deadline: midnight Monday, April 7th, 2014. Registration after this time will incur a $10 per race late fee and may be limited by map availability. 5:30pm-9:00pm: Packet pick-up and relay registration at event hotel, Comfort Inn and Suites, 3 Concord Lane, Newark DE 19713. 8:30am – 10:00am: Packet pick-up and relay registration at Saturday parking, Fair Hill MD. Temp-O: $12 if pre-registered, $15 at the event. SI-Card Rental: $3 per day, $40 if not returned. 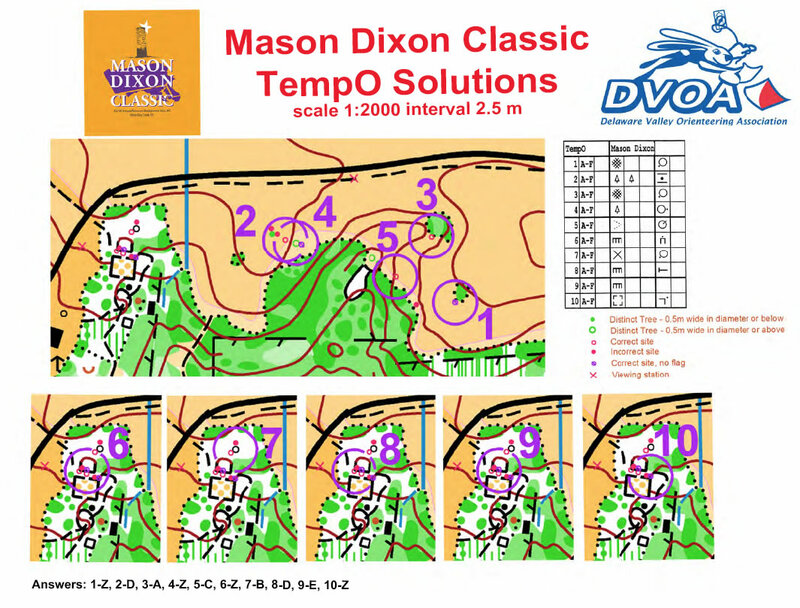 Preview Maps: Current (old) maps of Fair Hill Mason-Dixon and White Clay Creek are available through on-line registration at $5 per map. These maps may be printed with courses from previous events, and will only be available until supplies run out. If ordered by April 7th they will be mailed. If you plan to compete on a relay team in the US Relay Championships (whether or not your team is eligible), please register for the US Relay Championship by selecting “Yes”. If you plan to compete on a relay team and are eligible for US Championship status (whether or not your team is eligible), please check the box “Competing in US Champs”. Eligibility Rules for US Championships. If you plan to compete on a relay team in the Intercollegiate Relay, please register for the Intercollegiate Relay by selecting “Yes”. To compete in the Intercollegiate Relay you must be eligible and registered as part of an Intercollegiate Team in the Varsity, Junior Varsity or Club category. Eligibility Rules for the US Intercollegiate Championships. You may not compete in both the US Relay Championships and in the Intercollegiate Relay. Team rosters for the US Relay Championships are due no later than 10:00am, Saturday, April 26th. We would, of course, appreciate receiving the information earlier if possible! Please use this form or email the information to registrar@dvoa.org. Team rosters for the US Intercollegiate Championships, including the Intercollegiate Relay, are due no later than 10:00am, Saturday, April 26th. We would, of course, appreciate receiving the information earlier if possible! Please use this form or email the information to registrar@dvoa.org. The US Relay Championships will be held at Fair Hill on Saturday, April 26th with a mass start at 11:00am. Each US Relay Championship team must have 3 runners, and no one can run more than one leg. There are 3-point, 6-point and 9-point teams. Under 15 years of age or 60 and older receive 3 points. 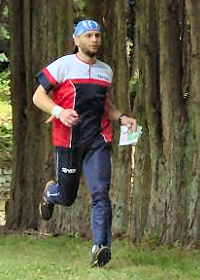 A female orienteer receives 2 points, in addition to any age points. For reference only, 3-point teams will run very approximately Green/Blue/Orange, 6-point teams will run Brown/Red/Yellow, and 9-point teams will run Orange/Brown/Yellow. Winning times will be approximately 90 minutes for the 3-point teams, ~80 minutes for the 6-point teams and ~70 minutes for the 9-point teams. There will be forking in all categories; control descriptions will be available only on the maps. Maps will be collected as every runner finishes. They will be released at the conclusion of the US Intercollegiate Relay Championship. To be eligible for US Championship medals, all team members must be current OUSA members and have the same club listed as their primary OUSA club. See www.us.orienteering.org/rules for more details on eligibility requirements. This year, the Intercollegiate Championships will consist of a JV, Varsity and Club Relay Championship; an Individual JV, Varsity and Club Championship; and a Varsity and Club Team Championship. Intercollegiate Relay Championship: The IC Relay will be held Saturday afternoon, April 26th, at Fair Hill with a mass start at 2:00pm. There will be divisions for JV College teams, Varsity College teams and Club College teams. See 2014 Rules for details about eligibility criteria. Each IC Relay team consists of two people from the same college or club team, one male and one female, each running twice. The running order is: male, female, male, female. Each IC Team may enter up to two relay teams. Total winning time for the Varsity Relay will be approximately 60 minutes and winning time for the Junior Varsity Relay will be ~50 minutes. 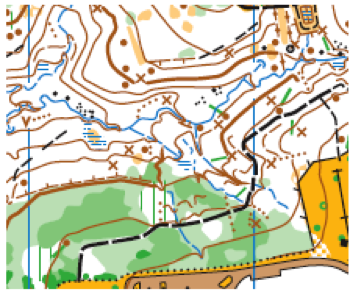 Individual legs of the IC Relay competition will be akin to short classic orienteering courses of intermediate to advanced technical difficulty and individual winning times of between 10 and 20 minutes. There will be forking on all relay legs; control descriptions will be available only on the maps. Maps will be collected as every runner finishes. They will be released at the conclusion of the US Intercollegiate Relay Championship. Competitors running in the IC Relay Championship may not also compete in the US Relay Championship. Intercollegiate Individual Championship:There will be individual classic distance orienteering on Sunday, April 27th at White Clay Creek. There will be IC Junior Varsity Male and Female classes and IC Varsity Male and Female classes. See 2014 Rules for details about eligibility criteria. You must register in these classes if you are competing in the IC Individual Championships or IC Team Championships. Intercollegiate Team Championships: IC Team champions, in the school and club divisions, will be determined by a combination of the IC Relay results and the IC Individual results. See 2014 Rules for details about eligibility criteria and scoring. On Saturday, April 26th, a Temp-O course will be available near the event center from 9.30am - 11.30am and from 1.00pm – 3.00pm. 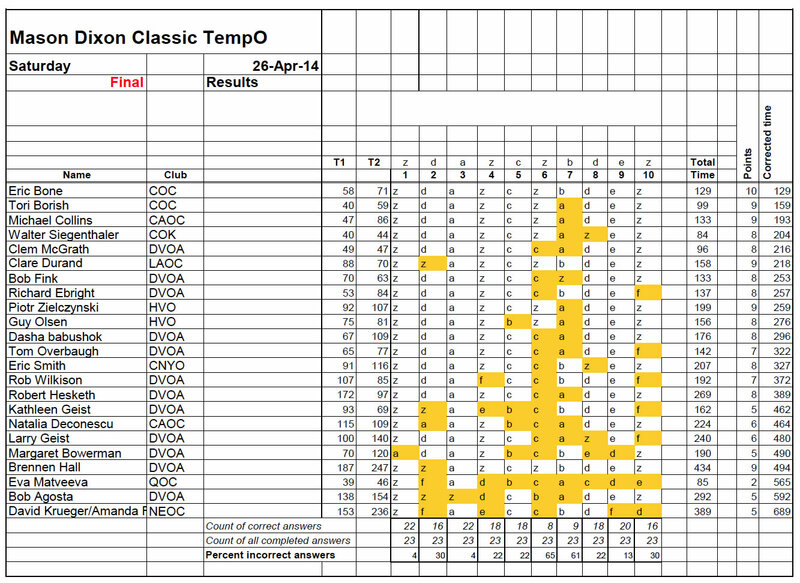 Temp-O is a form of Trail-O, a precision map reading competition in which each control is timed. More information about Trail-O can be found at www.dvoa.org/learn/trailo or www.trailo.org . In addition, the Italian trail-O website – www.trailo.it - has an excellent set of Temp-O practice problems. 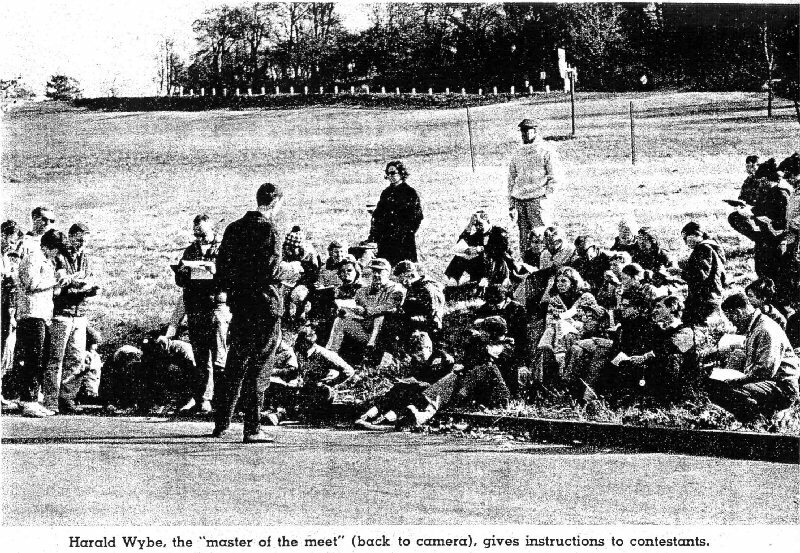 For non-Intercollegiate participants, there will be a full slate of Classic Orienteering courses and classes available on Sunday, April 27th at White Clay Creek. First start at 9am with a 3 hour course time limit. White and Yellow recreational courses will be available on Sunday only. Starts are between 9:30am and 11:30am with a 3 hour course time limit. The mapping was done by Marian Cotirta, who was responsible for WOC 2011 mapping (France). It is a fully expanded and revised map of DVOA's Fair Hill Mason Dixon map. Generally, the terrain is fast, while hilly. It is roughly half forested and half open (yellow). 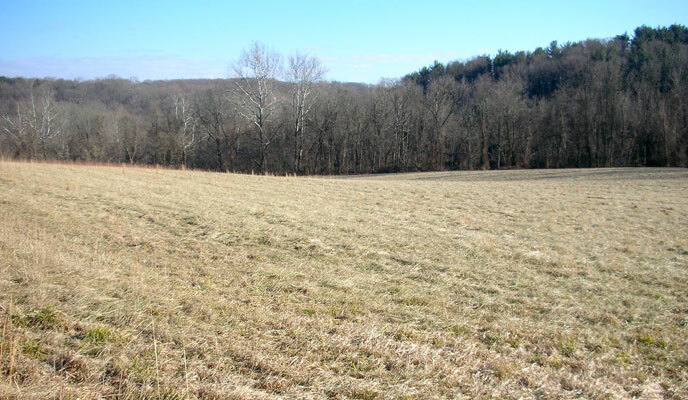 Some fields are bordered by fight, requiring precision entry/exit. There is other vegetation detail, but most woods are open (white). There is minimal rock, and the area is covered by a moderate trail network. Control descriptions will be available on the maps only. All maps from all relays will be collected as runners finish. They will be released at the conclusion of the IC Relay Championship. We encourage all runners to check out the warm-up area to become familiar with the mapper’s style and nuance. The map was field-checked over several weeks in November 2013. There was normal levels of rainfall at the time. No snow cover. The map has seen very minor edits in February 2014. It is 1:10,000, with 5 meter contours. The important aspects to note involve vegetation and dot knolls. Almost all dot knolls on the map started as a rootstock. That rootstock may have been exposed 20 years ago, and subsequently decayed, or it could have been uprooted in the past few months. In both cases, the mapper map have opted to map it as dot knoll. How should a runner interpret rootstocks in the terrain, to anticipate the map picture? Basically, if the gestalt is dominated more by dirt, it is a dot knoll. Again, it might be a tree that fell over the day before the field-checker found it. On the other hand, if less dirt and more wood, probably a rootstock. Rootstocks can also denote ruined trees that are still standing, i.e., a prominent stump. But, there are lots of fallen trees in the forest. How to tell which are on the map? A rough rule of thumb is if a normal runner cannot stride over it while running (and would rather need to slow and possible climb over) it will likely be mapped in this way. In most cases, these trunks can be surmounted without too much difficulty, but reading ahead, and vectoring to either end, may be a better strategy. There is a very low standard for boulders. They may be on the map if greater than 0.3 meters in height. For the US Relay Championships, legs 1 and 2 are forked. Leg 3 is not forked. For the Intercollegiate Relay Championships, all legs are forked. Control descriptions will be on the maps but not given out in advance. Maps will be collected at the finish and released after the Intercollegiate Relay Championships are decided. Controls may be in close proximity, but not closer than 30 meters. There will be a single water stop at one control on all of the 3 point US Relay Championships courses, and the longest 2 legs (1 & 2) of the 9 point category. Unless we see an abnormally warm day, there will not be a water stop on the 6 point courses. There are no water stops at controls in the Intercollegiate Relay Championships. Courses will be contested mostly across recently mowed meadows and through blindingly fast woods. Climb is low to moderate and footing very good. For long stretches, there may be nothing to impede top-end running speed whatsoever. However, not for 100% of the course. There are short stretches that will involve briars. These briars are vicious. A glancing blow will rend flesh. Full body covering is advised; it would be sheer folly to wear shorts. While even the most adroit elite will be scratched, discomfort will be reduced by reading ahead, reading carefully to note paths of least resistance—particularly along field edges—and avoiding vertical green slash. This map is also by Marian Cotirta. The current map has been fully revised and expanded. 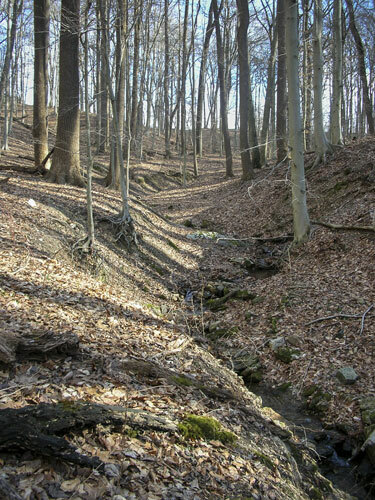 Compared to Fair Hill, White Clay Creek features similar topography but somewhat different vegetation. There are not as many open fields, some white woods, but there is also some slower running, with more medium green areas. There is limited to moderate contour detail. The western half of the mapped area features an extensive trail network, while the (new) eastern area has a more limited trail network. Control descriptions will be on the maps and also available at the Start call-up line. Maps will be collected at the finish and released after the last starts. The map scale is 1:10.000 with 5m contour interval. Field checking was done in Fall 2013 by Marian Cotirta. A final pass was made in January and February 2014 to update rootstocks and dot knolls. 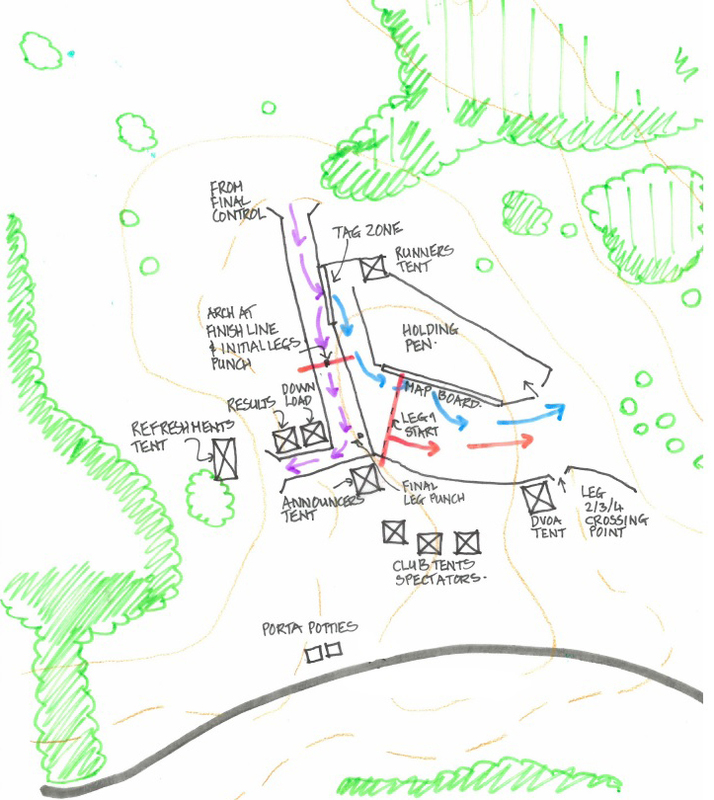 Mapped terrain includes the Carpenter Recreation Area of White Clay Creek State Park and portions of the White Clay Creek Preserve. The White Clay Creek is designated as a National Wild & Scenic River. Rootstocks and dot knolls are the predominant point features at White Clay Creek. Almost all dot knolls on the maps started as rootstocks. The mapper has used several different symbols to denote rootstocks and dot knolls. The rootstock symbol is used for relatively recent fallen trees that have a vertical or nearly vertical root bulb. In some cases, a green vegetation line may be shown with the rootstock to show the associated tree. Where the root bulb has degraded to be more rounded and is mostly dirt, the dot knoll symbol is used. Dot knolls may also have the green vegetation line attached. Distinct fallen trees without an associated distinct rootstock or dot knoll are shown with only the green vegetation line. Generally, mapped rootstocks are at least 1m high with a few exceptions in some of the more open woods where rootstocks slightly less than 1m have been mapped. Mapped dot knolls are generally higher than 0.5 m.
The mapper has chosen to use a new symbol to denote former fence / property lines. The symbol is a dashed brown line with perpendicular slope tags. The lines in the terrain tend to be fairly subtle and are more discernible in the open woodlands. In many cases, the lines cut across contours making it impossible to convey the terrain shape using the more common form line symbol. Vegetation has been carefully mapped. In addition to the three shades of green, green slashes are used to show areas of undergrowth. The lighter green slash represents undergrowth with slow running. The denser green slash represents undergrowth with difficult running. In both cases, the impediment to running is generally brambles. A small map sample is shown below to demonstrate the mapping convention for rootstocks, dot knolls and former fence lines. Allow plenty of time for the bus ride and 1.2 km walk to the start. Warm up is along the trail leading to the start. Course time limit is 3 hours. Loose control descriptions will be available at the second start call up line. All courses cross White Clay Creek (an uncrossable water feature) using a bridge. Control density is high in some areas. Be sure to check control codes carefully. There are several out of bounds areas. The golf course along the eastern edge of the map may not be crossed. There is a private office complex belonging to Computer Sciences Corporation at the southeastern edge of the map that may not be crossed. There are several private residences within the park that are off limits. All of the above out of bounds areas have been marked with red slash on the maps. If an area is not marked out of bounds with red slash, it may be crossed. There are road crossings on some courses. Crossings are unstaffed – exercise caution. Runners on some courses may notice old orange and black signs stating “Danger Shooting Range – Keep Out.” The shooting range is no longer in operation. These signs can be ignored. The solid dark green vegetation and denser green slash represent uncrossable areas of briars. Vegetation should be considered when planning routes. Leg coverings are recommended. Spectator controls are incorporated near the finish arena. Competitors are encouraged to cheer on runners as they approach the finish. White and Yellow recreational courses will be available on Sunday only. Pre-registration is not required, but please contact the Registrar if you are planning to bring a group of five or more people. Start window: 9.30 am – 11.30pm, time limit 3 hours. Fees: $10 per map, which includes an electronic punch if needed. The recreational courses on Sunday do not require the bus ride; the start for these courses is located near the parking. Please note that there will be busing on both Saturday, April 26th and Sunday, April 27th. Saturday Directions and Parking: Parking for all Saturday events, the US Relay Championship, the IC Relay Championships and the Temp-O, will be in the Fair Hill parking lot on DE Rt. 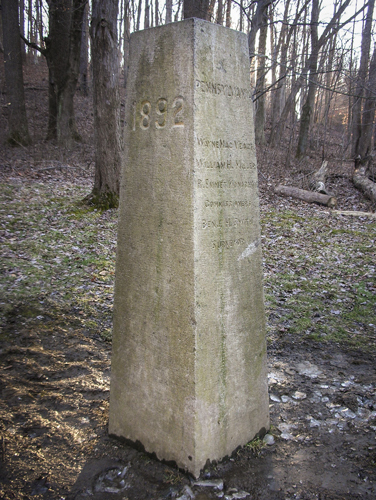 273, approximately one half mile east of the intersection with DE Rt. 213. It is located at GPS coordinates 39.701929, -75.859582. From the north, exit I-95 at Exit 1B and take DE- 896 north. Stay on S. College Ave. into Newark. Turn left onto DE-273 and go ~6 miles (it turns into MD-273 after about 1 mile). The parking will be on the right. From the south, exit I-95 at Exit 100A and take MD-272 north approximately 5.5 miles to the intersection with MD -273. Turn right onto Rt. 273 and go ~6.5 miles. The parking will be on the left. Saturday Event Center and Busing: The Saturday arena is remote and there is no parking allowed; there will be busing to and from the parking lot and the event center all day. All relays will use the same start, finish and exchange zone configuration. A basic schema of the arena area will be available at or before the day of the event. The Temp-O will be in the same general area. The bus ride is approximately five miles or fifteen minutes. Toilets will be available at the event parking and at the event center. Plan to take all items that are required for the day with you on the bus. Club tents and/or other paraphernalia are encouraged. Show your club spirit! We are working on having food vendors available; check back for details. Sunday Event Center and Busing: The Sunday arena is at the parking area with busing from the parking to the starts. There will be an approximately two mile, ten minute bus ride to the bus drop-off area, and then a flat 1.2km walk to the Start area. Please plan accordingly. Toilets will be available at the event parking and the bus drop-off area, but not at the Start, which is in a public area. Warm-up clothing may be left at the Start call-up line. Event Hotel: Comfort Inn and Suites, 3 Concord Lane, Newark DE 19713. 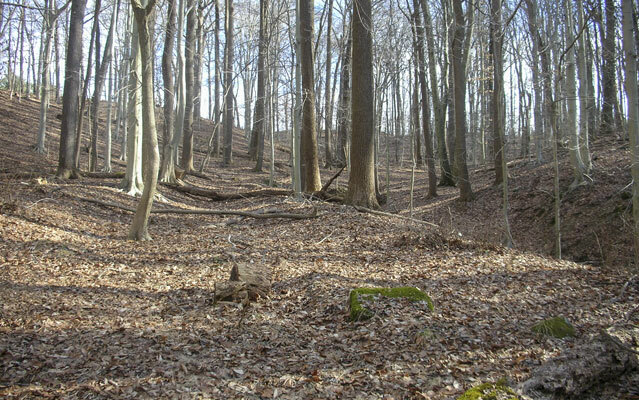 There is a discounted group booking rate of $89 + 8% tax; call 302-737-3900 and mention DVOA Orienteering A meet. Another convenient and recommended hotel is the Ramada Newark/Wilmington, 260 Chapman Road, Newark DE 19702 with a discounted rate of $69 + 8% tax, including hot breakfast. Call 302-738-3400 and mention DVOA Orienteering. The Juniors are once again providing sandwiches for this event. Sandwiches are $5 each. Payment should be made when you register for the event and you can order as many as you wish for each day. Once you pay for them, please don't forget to submit your order details here. SI card rental is available for $3 per day with a $40 replacement fee if not returned. Current (old) maps of Fair Hill Mason-Dixon and White Clay Creek are available through on-line registration at $5 per map. These maps may be printed with courses from previous events, and will only be available until supplies run out. If ordered by April 7th they will be mailed. There will be no pre-set childcare available. Special arrangements can be made on an individual basis, with advanced notice to the Event Director no later than ten days prior to the event. Please email registrar@dvoa.org to set this up. On both days, there will be no dogs allowed on the buses, or on the courses. EMS will be on site both days at the event arena. 6.00pm, First Presbyterian Church, 292 West Main Street, Newark DE 19711. Menu: buffet with various pasta dishes (some vegetarian) with salad and rolls. 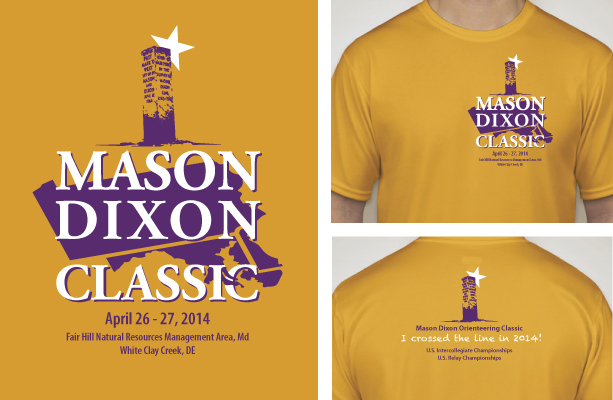 Commemorative shirts (sizes S, M, L, XL, XXL, XXXL) will be available for $18 per shirt.